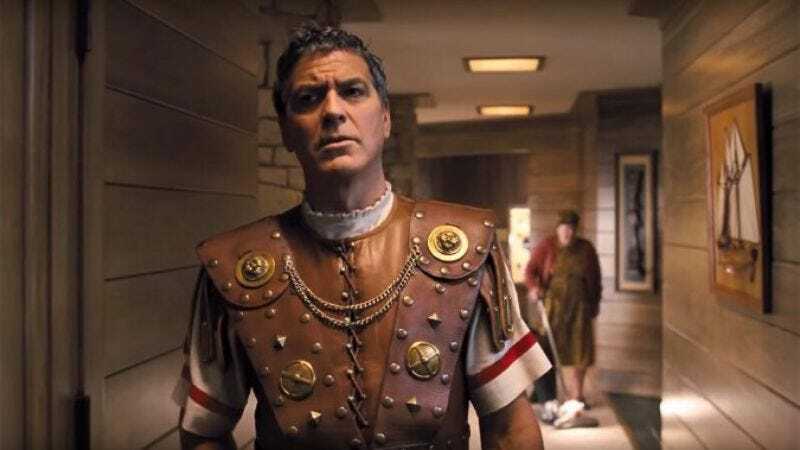 After going somber and subtle with the folk-music folktale Inside Llewyn Davis, Joel and Ethan Coen are making a big return to the world of screwball comedy with Hail, Caesar! The film follows a movie studio fixer on the trail of an AWOL A-lister in what will surely be the directing duo’s most direct send-up of Hollywood since Barton Fink. As if that weren’t enough of a draw, they’ve corralled together a top-notch cast of some choice repertory players (George Clooney, Josh Brolin, Frances McDormand, and Scarlett Johansson) and other big names making their Coen picture debut (Ralph Fiennes, Channing Tatum). Hail, Caesar! opens nationwide on February 5, but The A.V. Club and Universal Pictures have an opportunity for you to see it for free on February 2. For your chance to win a pair of passes to the advance screening, simply follow the link here and enter your information. Remember: Advance screenings are often intentionally overbooked, so be sure to arrive early if you want to guarantee yourself a seat. An official plot synopsis and trailer for the film can be found below. Four-time Oscar-winning filmmakers Joel and Ethan Coen (No Country For Old Men, True Grit, Fargo) write and direct Hail, Caesar!, an all-star comedy set during the latter years of Hollywood’s Golden Age. Starring Josh Brolin, George Clooney, Alden Ehrenreich, Ralph Fiennes, Jonah Hill, Scarlett Johansson, Frances McDormand, Tilda Swinton, and Channing Tatum, Hail, Caesar! follows a single day in the life of a studio fixer who is presented with plenty of problems to fix.